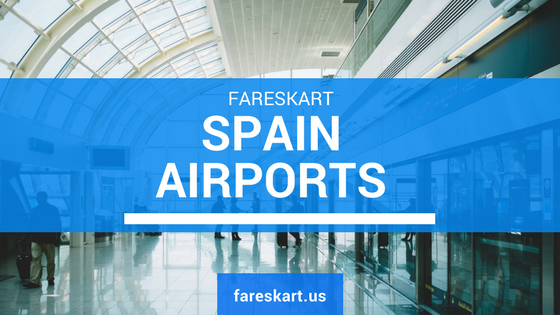 Fareskart has gathered all important details in depth about Spain Major Airports and Airline which offer you cheap flights to Spain.We have deals available from more than 450 airlines that will let you select cheapest flights to Spain as per your need. 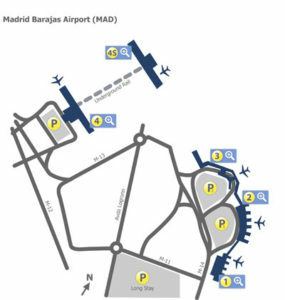 Here is List of Major International Airports in the Major City of Spain. Madrid Barajas Airport, Adolfo Suárez Madrid–Barajas Airport. It is located in the District of Barajas in Madrid.It operates flights to Asia, Europe, America, Canada and many other countries. It has 5 passenger Terminals (1, 2, 3, 4 and 4S). Terminal 3 is barely used, just as a support of Terminal 2.Terminal 1: This Terminal operates mainly with International flights. Barcelone Airport is also known as “EL Prat Airport” and Barcelone is also one of a second biggest city in Spain.BCN is one of busiest airports in the world.There are two terminals at the airport. The T1, which was completed in 2009, is the main terminal. The oldest one is the T2 terminal and currently has no such intense activity as T1. Most flights are covered by low-cost airlines. Palma De Mallorca Airport third busiest Airport in Spain over 173,000 flights arrive and depart at this airport every year.Palma Airport currently has four terminals and covers an area of 6.3km2. Terminal A serves domestic flights while terminals B, C, and D cater for international flights.